Opportunity to support considerable loads. The penalty, however, is increased fabrication costs . The article describes alternative forms of truss, where and why different forms might be appropriate and introduces design considerations. Primarily, pin jointed trusses are discussed, with some discussion of rigid-jointed Vierendeel trusses. A truss is essentially a triangulated system of (usually) straight interconnected structural elements; it is sometimes also referred to as an open web girder. The individual elements are connected at nodes; the connections are often assumed to be nominally pinned. The external forces applied to the system and the reactions at the supports are generally applied at the nodes. When all the members and applied forces are in a same plane, the system is a plane or 2D truss. The principal force in each element in a truss is axial tension or compression. Two types of general arrangement of the structure of a typical single storey building are shown in the figure below. Lateral stability provided by portal trusses. 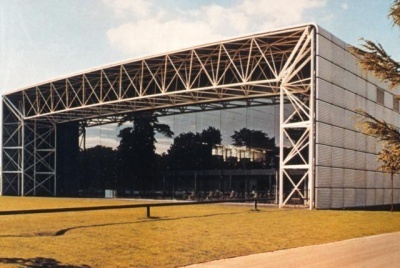 Building braced in both directions. In the first case (left) the lateral stability of the structure is provided by a series of portal trusses; the connections between the truss and the columns provide resistance to a global bending moment. Loads are applied to the portal structure by purlins and side rails. 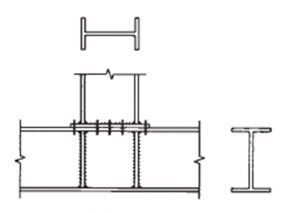 In the second case, (right) each truss and the two columns between which it spans, constitute a simple structure; the connection between the truss and a column does not resist the global bending moment, and the two column bases are pinned. Bracing in both directions is necessary at the top level of the simple structure; it is achieved by means of a longitudinal wind girder which carries the transverse forces due to wind on the side walls to the vertical bracing in the gable walls. Longitudinal stability is also provided by a wind girder in the roof and vertical bracing in the elevations. Trusses comprise assemblies of tension and compression elements. Under gravity loads, the top and bottom chords of the truss provide the compression and tension resistance to overall bending, and the bracing resists the shear forces. 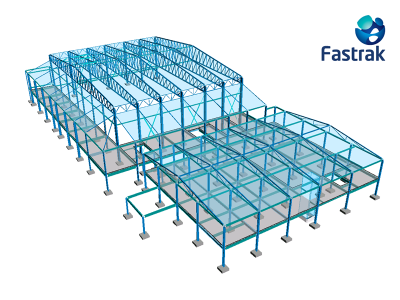 A wide range of truss forms can be created. Each can vary in overall geometry and in the choice of the individual elements. Some of the commonly used types are shown below. Pratt trusses are commonly used in long span buildings ranging from 20 to 100 m in span. In a conventional Pratt truss, diagonal members are in tension for gravity loads. This type of truss is used where gravity loads are predominant (see below left). An alternative Pratt truss is shown (below right) where the diagonal members are in tension for uplift loads. This type of truss is used where uplift loads are predominant, which may be the case in open buildings such as aircraft hangers. Limit the buckling length of members in compression (although in a 2D truss, the buckling length is only modified in one axis). For the Pratt truss and any of the types of truss mentioned below, it is possible to provide either a single or a double slope to the upper chord of a roof supporting truss. An example of a double (duo-pitch) Pratt truss is shown below. In this type of truss, diagonal members are alternatively in tension and in compression. The Warren truss has equal length compression and tension web members, and fewer members than a Pratt truss. A modified Warren truss may be adopted where additional members are introduced to provide a node at (for example) purlin locations. 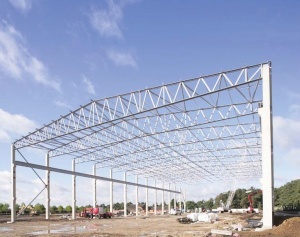 Warren trusses are commonly used in long span buildings ranging from 20 to 100 m in span. This type of truss is also used for the horizontal truss of gantry/crane girders. North light trusses are traditionally used for short spans in industrial workshop-type buildings. They allow maximum benefit to be gained from natural lighting by the use of glazing on the steeper pitch which generally faces north or north-east to reduce solar gain. On the steeper sloping portion of the truss, it is typical to have a truss running perpendicular to the plane of the North Light truss, to provide large column-free spaces. The use of north lights to increase natural daylighting can reduce the operational carbon emissions of buildings although their impact should be explored using dynamic thermal modelling. 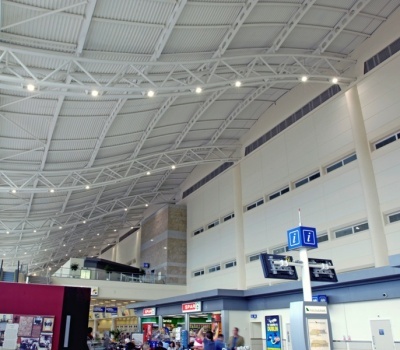 Although north lights reduce the requirement for artificial lighting and can reduce the risk of overheating, by increasing the volume of the building they can also increase the demand for space heating. Further guidance is given in the Target Zero Warehouse buildings design guide . A variation of the North light truss is the saw-tooth truss which is used in multi-bay buildings. Similar to the North light truss, it is typical to include a truss of the vertical face running perpendicular to the plane of the saw-tooth truss. The Fink truss offers economy in terms of steel weight for short-span high-pitched roofs as the members are subdivided into shorter elements. There are many ways of arranging and subdividing the chords and internal members. This type of truss is commonly used to construct roofs in houses. For the same steel weight, it is possible to get better performance in terms of resistance and stiffness, with a truss than an I beam. This difference is greater for long spans and/or heavy loads. The full use of this advantage is achievable if the height of the truss is not limited by criteria other than the structural efficiency, e.g. a limit on total height of the building. However, fabrication of a truss is generally more time consuming than for an I beam, even considering that modern fabrication equipment is highly efficient. An advantage of the truss design for roofs is that ducts and pipes that are required for operation of the buildings services can be installed through the truss web, i.e. service integration. For efficient structural performance, the ratio of span to truss depth should be chosen in the range 10 to 15. The architectural design of the building determines its external geometry and governs the slope(s) given to the top chord of the truss. The intended use of the internal space can lead either to the choice of a horizontal bottom chord, e.g. where conveyors must be hung under the chord, or to an inclined bottom chord, to allow maximum space to be provided. The orientation of the diagonal members should be such that the longest members are subject to tension (the shorter ones being subject to compression). Many solutions are available. Choice of members depends on the magnitude of the internal forces, ease of connections between members, aesthetics and any necessity to connect prefabricated truss sections on site. When selecting members, the out-of-plane buckling resistance will be important, together with resistance under reversed loading, for example, uplift. For smaller spans, tee sections are frequently used for chords, with angles used as internal members. The internal members may be bolted or welded to the tees. Back-to-back angles or channels may be used for longer spans or heavier loads, with a gusset plate used at nodes to connect the members. For large trusses and heavy loads, typically found in transfer trusses in buildings, members may be rolled sections; typically UKC sections. Nodes are usually welded. Any necessary connections are completed with bolted splices within the length between nodes. For many exposed trusses, hollow sections are chosen for their structural efficiency and for aesthetic reasons. Nodes will generally be welded in the workshop. As part of the truss design, it is essential to verify the resistance of the joints (in accordance with BS EN 1993-1-8) as the joint design may dominate member selection and final truss geometry. Members should be selected carefully to avoid expensive strengthening of trusses fabricated from hollow sections. For all the types of member sections, it is possible to design either bolted or welded connections. Generally in steelwork construction, bolted site splices are preferred to welded splices for economy and speed of erection. Where bolted connections are used, it is necessary to evaluate the consequences of 'slack' in connections. In order to reduce these consequences (typically, the increase of the deflections), pre-loaded assemblies to produce non-slip joints are recommended. Hollow sections are typically connected by welding whilst open sections are connected by bolting or welding, which will usually involve the use of gusset plates. Guidance on the design of welded joints for Celsius®355 and Hybox®355 hollow sections is available from Tata Steel. Small trusses which can be transported whole from the fabrication factory to the site, can be entirely welded. 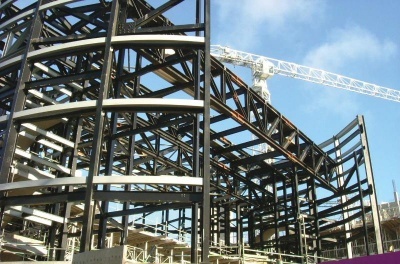 In the case of large roof trusses which cannot be transported whole, welded sub-assemblies are delivered to site and are either bolted or welded together on site. 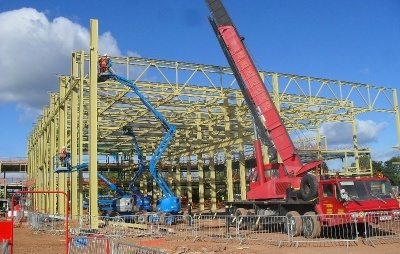 In light roof trusses, entirely bolted connections are less favoured than welded connections due to the requirement for gusset plates and their increased fabrication costs. It is necessary to design members in compression against out-of-plane buckling. For simply supported trusses, the upper chord is in compression for gravity loading, and the bottom chord is in compression for uplift loading. For portal trusses, each chord is partly in compression and partly in tension. Lateral restraint of the upper chord is generally given by the purlins and the transverse roof wind girder. For the restraint of the bottom chord, additional bracing may be necessary, as shown below. Such bracing allows the buckling length of the bottom chord to be limited out of the plane of the truss to the distance between points laterally restrained; the diagonal members transfer the restraint forces to the level of the top chord, where the general roof bracing is provided. It is possible to create a horizontal wind girder at the level of the bottom chords, with longitudinal elements to stabilize all the trusses. It is convenient to arrange a transverse wind girder at each end of the building so that the longitudinal members need act only in tension. It is necessary to provide a longitudinal wind girder (between braced gable ends) in buildings where the roof trusses are not 'portalized'. The posts (if required) are the upper chords of the consecutive stabilized roof trusses. Although joints in trusses are often hardly pinned in reality, it is generally satisfactory (and encouraged by design Standards) to assume the joints are pinned and to verify the members for axial load only. If loads are applied between nodes, trusses are often analysed with continuous chords, but with all internal members pinned. These assumptions about pinned joint behaviour apply to both bolted and welded connections. Where member centre lines do not intersect at a node (the joint geometry may have been adjusted to increase the strength of the joint), the additional moments produced by the eccentricity are usually allowed for in the design of the chord members. Several questions arise in respect of the modelling of a truss. It is usually convenient to work on restricted models. For example, for a standard building, it is common and usually justified to work with 2D models (portal, wind girder, vertical bracing) rather than a global 3D model. A truss can be modelled without its supporting columns when it is articulated to the columns. If separate models are used, it may be necessary, in order to verify the resistance of certain elements, to combine the results of several analyses; example: the upper chord of a truss also serves as chord of the wind girder. If a global 3D model is used and appropriate member releases not provided, 'parasitic' bending can be observed, which often only creates an illusory precision of the structural behaviour. Pinned joints throughout the truss. When the connections between elements which make up a truss are bolted, with bolts in shear and bearing (category A in BS EN 1993-1-8 ), the clearance introduced into these connections (which allows slip) can have a significant effect on displacement of the nodes. In order to facilitate erection, the bolts are located in holes which are larger than the bolts themselves. For standard bolt sizes, holes which are 2 mm bigger than the bolt are usually made (usually referred to as a clearance hole). In order for a connection with clearance holes to transmit the load, the bolt must come into contact with one or other of the connected parts which allows slip in the connection. For a connected tension member, this slip can be considered as an additional extension that is added to the elastic elongation of the member in tension. Likewise, for a connected compression member, the slip is considered as a reduction in length that is added to the elastic shortening of the compressed member. Increase in the deflection can result in reduction in the slope of the supported roof and even, if the nominal slope were small, to a slope inversion; the risk of water ingress is increased. To use welded connections instead of bolted connections. Truss members are subjected to axial force, but may also be subjected to bending moments, for example, if the chords have been modelled as continuous. Buckling of the member is controlled by applying a reduction factor to the resistance of the cross-section. In most truss members, only flexural buckling of the compressed members in the plane of the truss structure and out of the plane of the truss structure need be evaluated. The buckling resistance is obtained from BS EN 1993-1-1 by applying a reduction to the resistance of the cross-section. This reduction factor is obtained from the slenderness of the member, which depends on the elastic critical force. For buckling in the plane of the truss, the buckling length is taken equal to 90% of the system length (distance between nodes), when the truss member is connected at each end with at least two bolts, or by welding. For buckling out of plane of the truss beam, the buckling length is taken equal to the system length. For buckling in the plane of the truss of the chord members in uniform compression, the buckling length may be taken as 90% of its system length (distance between nodes). For buckling out of plane of the truss, the buckling length must be taken between lateral support points. All the purlins connected to a roof bracing can be considered as lateral rigid support points. Intermediate purlins can also be considered as a rigid point of support, if the roof behaves as a diaphragm (class 2 construction according to BS EN 1993-1-3). Lateral support points are provided to the lower chord by additional vertical bracing elements between trusses. Vierendeel trusses are rigidly-jointed trusses having only vertical members between the top and bottom chords. The chords are normally parallel or near parallel. Elements in Vierendeel trusses are subjected to bending, axial force and shear , unlike conventional trusses with diagonal web members where the members are primarily designed for axial loads. Vierendeel trusses are usually more expensive than conventional trusses and their use limited to instances where diagonal web members are either obtrusive or undesirable. Vierendeel trusses are moment resisting. Vertical members near the supports are subject to the highest moments and therefore require larger sections to be used than those at mid-span. Considerable bending moments must be transferred between the verticals and the chords, which can result in expensive stiffened details. As Vierendeel trusses are statically indeterminate structures, computer analysis software packages are generally used to analyse the truss. Vierendeel trusses have rigid joints which must transfer significant bending moments, especially near the supports. Welded joints are therefore common and may involve significant local reinforcement of the members at the joint. If joints are bolted, substantial connections will be necessary, generally using pre-loaded bolts.